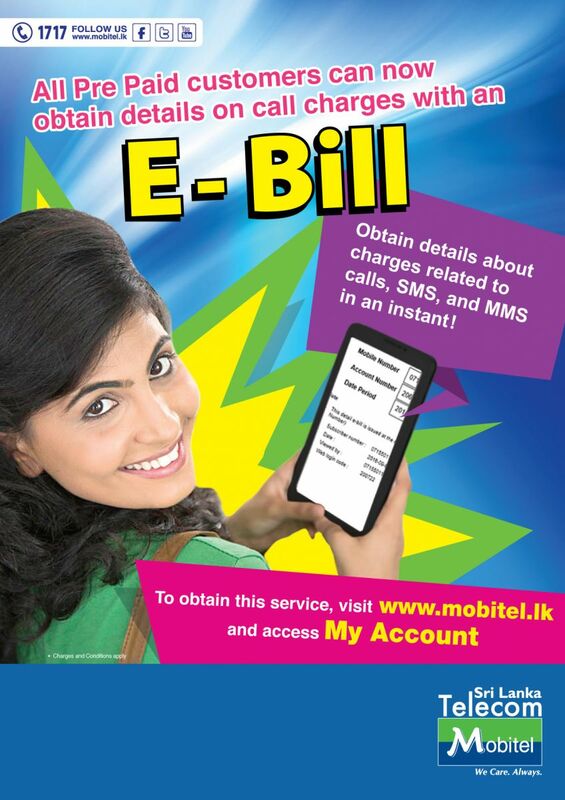 E-bill is a service available for prepaid subscribers to view their past call, SMS & MMS records online. What are the services captured under e-bill? Voice related incoming & outgoing records, SMS outgoing records & MMS records can be viewed using e-bill. What is the duration of the records captured under e-bill? Past three months call records are available. You need to have a Mobitel my account access to access e-bill facility. Do I need to have “my account” to access this service? Yes. My account registration is mandatory to access e-bill facility. Can I access my e-bill using someone else’s “my account” if I don’t have one? No. You cannot. It is not allowed due to security & confidential reasons. What are the charges applicable for e-bill service? Can I view my incoming SMS & MMS details? No, Incoming SMS & MMS records cannot be viewed under e-bill. Can I view content of call, SMS & MMS I have received or sent during past three months under e-bill? What is the E-bill generation process? Once data verified, a “PIN” will be sent to your mobile. Follow the instructions given & select enter “PIN” received to process e bill. Necessary charges will be deducted from your account and e bill will be send to your email. Past three months data will be captured under e bill. Customer should be a re-registered customer under Mobitel system. Only voice incoming & outgoing, SMS outgoing & MMS outgoing data will be available. Charges deducted will not be refundable at any circumstances. Upon successful verification, e bill will be sent to your e mail address within 3 hours from the requested time. Saving PDF and retain for future access is possible for users as it will be a separate document sent to e mail. Using the same PIN for another e bill process is not allowed and a new PIN will be generated and sent for each time you request the bill. Can I use the same pin number for next month? Sorry, you cannot use the same pin number. You have to have a new pin number for each time you want to request for the e-bill. Can any type of customer can use this service? No, only re-registered customers can use this service. If I get re-registered now can I get my past three months records? No, you can get only from the date you got active as a re-registered customer.